How does a hihi get high? It feasts on a forbidden, mind-altering fungus, that's how. The hihi, in case you don't know, is a small, quirky bird native to New Zealand that usually likes to dine on fruits, nectar and the occasional insect. But a group of the rare birds at a wildlife sanctuary in the city of Wellington recently experimented with something a little more adventurous – with pretty psychedelic consequences. 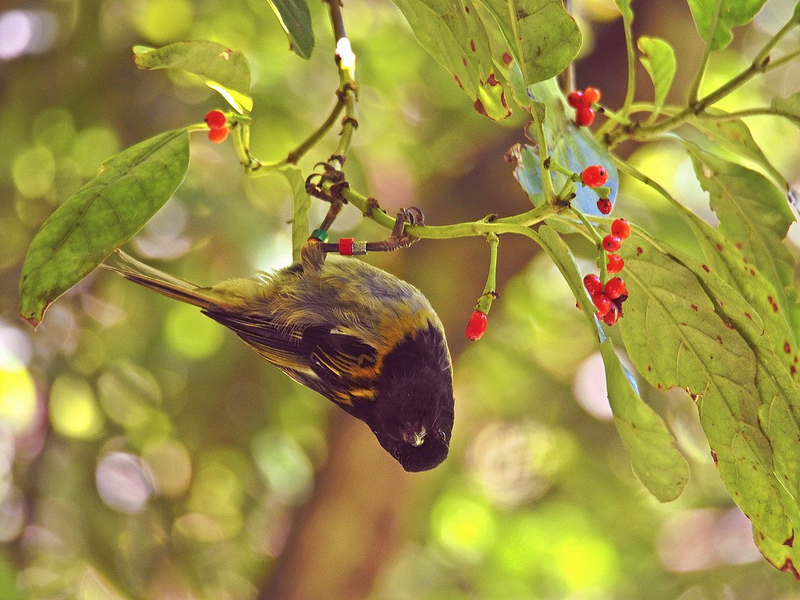 According to the Zealandia Sanctuary, five of its hihi (also known as stitchbirds) were found "sort of paralysed or spasming" shortly after they were seen sampling an unidentified fungus. While sanctuary staff were unable to confirm the type of fungus, they suspect magic mushrooms may be the reason behind the birds' unusual behaviour ... although it's likely that the hihi were not after the 'shrooms at all. "For a species to suddenly go from nectar and insect eating to apparently eating fungi, that's a bit of a strange one. One explanation may be that there were some insects on the fungi," the sanctuary's lead ranger for conservation Matu Booth tells the New Zealand Herald. Once common all across New Zealand's North Island, the hihi (Notiomystis cincta) was driven to extinction on the mainland and many offshore islands during the nineteenth century. Today, it's one of country's rarest birds, its populations limited to a small number of island refuges. In 2005, Zealandia become the first mainland location to host wild hihi in over a century. Luckily for the sanctuary's trippy hihi, their brief mind-bending experience didn't have any long-lasting negative effects. After a few hours' isolation in a cardboard box, they all recovered. Booth adds: "We've never heard of hihi eating mushrooms before, but that's not to say that they don't. We do know that tui get drunk on the nectar of flax flowers and have been affected by rhododendron flowers, so it's not unusual for animals to have effects from eating something." Aaah, the hazards faced by wildlife photographers ... Hazard #168: Getting punched by an intoxicated mountain goriila. Did these elephants get just a little drunk on marula fruit?